One of the most famous Italian pasta shapes and loved across Italy, Penne, which means "pen" in Italian, gets its name from its shape. The tube-shape with angled ends was inspired by the quill of an old style ink pen. 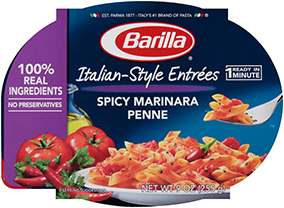 Barilla® Penne is made with non-GMO ingredients. For more information, please read our position. Return to a boil. For authentic "al dente" pasta, boil uncovered, stirring occasionally for11 minutes. For more tender pasta, boil an additional 1 minute.